Key to keeping your batteries charged in the Bahamas is an alternative energy source. With diesel over $5/gallon who wants to run the engine or a generator to power refrigeration and autopilot. “Is wind or solar a better choice?” I am often asked and see posted in online mailing lists or chatboards where I hang out. While the choice is a matter of opinion, I see and hear a quiet preference for wind. The choice is affected by your cruising ground, space restrictions on your yacht, etcetera. In this article, I will lay out the pluses and minuses for either option. People prefer wind because on average it produces more power, more consistantly. You might think in the Caribbean that sun would be the best source. But do not forget the tradewinds blow nearly without fail night and day, sunshine or rain. Wind is consistant. Further north wind makes even more sense as days become short in the winter and the sun fades. The darkness of cruising areas such as the Pacific Northwest precludes the use of solar. 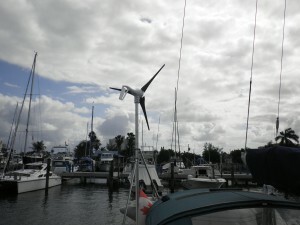 Wind generators, I find, are also easier to find space for on a yacht. It is less obtrusive to find space to mount a pole than surface area for panels. Despite the inconsistency, people love solar because it is a perfectly quiet power source. Whirling wind generators grate on your ears after awhile. A big point of alternative energy is to avoid running a noisy motor. Why then install a turbine? Solar advocates also tout the increasing efficiency and low cost of newer model panels. And they argue that wind generators need more than 10 to 15 knots to produce enough power which in light wind areas or secluded harbors can be difficult to get. The spinning blades of a wind generator is also a dangerous obstacle while aboard. Solar on the other hand has no moving parts. Costwise both run a couple thousand to install. Depending on your cruising grounds and noise toleration, both wind and solar are viable choices. In the end, many yachts have both as well as even a portable gas generator or inboard diesel to cover all bases. When it is sunny, the solar panels charge the batteries while at night or on rainy days the wind generator catches the breeze. When neither, crank up the generator. What do you have your yacht? I welcome all comments in regards to the issues covered here as well as new ones not brought up. Last Thursday Night around midnight, a woman from Houston, Texas was arrested, jailed, and charged with manslaughter for shooting a man 6 times in the back as he was running away with her purse. The following Monday morning, the woman was called in front of the arraignment Judge, sworn-in, and asked to explain her actions. The woman replied, “I was standing at the corner bus stop for about 15 minutes, waiting for the bus to take me home after work. I am a waitress at a local cafe. I was there alone, so I had my right hand on my pistol in my purse hanging on my left shoulder. All of a sudden I was spun around hard to my left. As I caught my balance, I saw a man running away with my purse. I looked down at my right hand and saw that my fingers were wrapped tightly around my pistol. The next thing I remember is saying out loud, “No Way Punk! You’re not stealing my pay check and tips.” I raised my right hand, pointed my pistol at the man running away from me with my purse, and started squeezing the trigger of my pistol! When asked by the arraignment judge, “Why did you shoot the man 6 times? The woman was acquitted of all charges. She was back at work the next day! That’s Gun Control Texas Style. AMEN!